We’ll make sure your preferred business name is available in your state of incorporation. If your desired name is not available, we will contact you for alternate suggestions and keep working with you until we find a solution. We’ll review your information for accuracy, audit your documents for compliance with State law and requirements. We'll review your information for accuracy, create your incorporation documents in according with state requirements and file them with the Secretary of State on your behalf. If you will have any questions during process of incorporation or later, just email us and our highly trained incorporation specialists will be happy to answer free of charge. Please note that Company Express (Delaware) Ltd is document filling service and we do not provide legal, tax or financial advise. Every State requires that (i) Corporations and LLCs organized under its jurisdiction and (ii) foreign Corporations and LLCs qualified to do business in that State designate a Registered Agent. The Registered Agent is responsible for receiving on behalf of the represented company, and forwarding, official, i.e., governmental, correspondence from the federal and relevant State Governments including service of process, franchise/other tax forms, and annual report forms. The Registered Agent is generally required to has a physical address within the relevant State and is available to accept service of process on behalf of the Corporation or LLC during normal business hours. The Registered Agent's name and address are included in the Articles of Incorporation and this information is a matter of public record. By selecting Company Express(R) as your Registered Agent provider, you will ensure that this important service is with the utmost care and efficiency. Company Express will obtain a Certified Copy of your company's incorporation document(s). The Certified Copy is an additional document issued by the state of incorporation, which further authenticates the original incorporation document(s). A certified copy of incorporation documents is often required to open a business bank account. The corporation's by-laws set forth the company's rules and regulations. Companies do not file the bylaws with the Secretary of State. Instead, businesses keep them with their internal company records. We will prepare for you customized By-Laws using our standard forms approved by the lawyers and information form your order form. Based on information provided in the order form, we will prepare for you Minutes of the first meeting of the Board of Directors regarding appointing officers of corporation, issuance of stock certificates and etc. An Apostille is a certification provided under the Hague convention of 1961 for authenticating documents for use in foreign countries. An Exemplified certification covers those countries who did not sign the Hague Treaty. The sole function of the Apostille or Exemplified certificate is to certify the authenticity of the signature of the document. After your Corporation is formed, you must observe corporate formalities such as holding annual meetings of shareholders, adopting By-laws and issuing shares of stock in order to maintain the integrity of the Corporation. Company Express’ Corporate and Kits contain the documents and related items you will need for this. 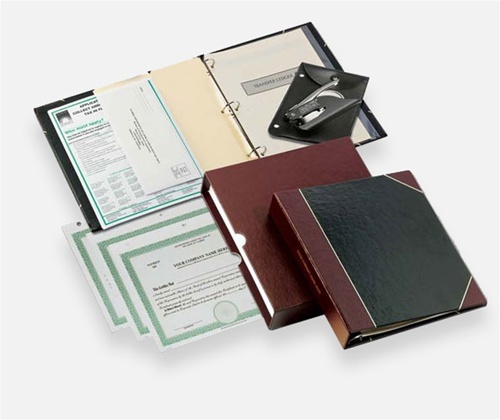 Our Corporate Kit includes: Personalized Binder, Corporate Seal, 20 Stock Certificates, Index Tabs, Transfer Ledger, Tax forms. Company Express will ship your company's state-approved incorporation document(s) using FedEx Overnight. In cases where the Certified Copy document is not included with the state-approved incorporation document(s), we ship the Certified Copy via FedEx Overnight. In some states, the Certified Copy can be shipped up to two weeks after the incorporation document(s). Expedited Processing Service speeds the turn-around time for your order. Company Express prioritizes your order above non-expedited orders and utilizes standard expediting services offered by your state of incorporation (state-level expediting fees may apply). Documents are sent to and from the state using same-day or overnight delivery methods. When the process is complete, we ship the state-approved incorporation documents to you using express delivery. US domestic businesses are required to have a Federal Tax ID Number, also called an employer identification number (EIN). We will obtain your company's EIN from the IRS once your business formation is approved by the state. The typical turn-around time for this service is 5-7 business days after we receive the required signature and documents from you.